The news came in the middle of the night in frantic text messages, phone calls or unfurled across TV screens: Donald Trump had won. An active member in the Naperville LGBT community, include lesbian women, bisexual people, gay men, and other lgbt people, Eva-Genevieve Scarborough is trying to wrap her head around electing Donald Trump president and Mike Pence as the vice president. "I'm numb, shell-shocked. I'm angry," Scarborough said. "I keep asking myself, what did we do wrong? Where did we fall short?" 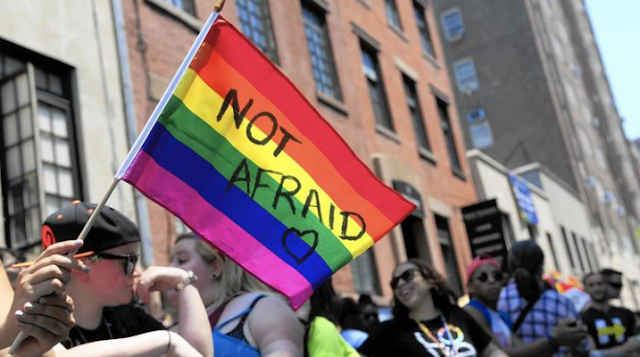 Garden State Equality Executive Director Christian Fuscarino said it was a "very dark day for so many minorities in America, but especially for the LGBT community." He noted that Trump has vowed to repeal marriage equality, and his vice presidential pick, Indiana Gov. Mike Pence, is a supporter of conversion therapy, a discredited "treatment" for turning homosexuals into heterosexuals. Because of that, supporters might get the idea that it's "open season on the LGBT community." "It paints an even bigger target on the back of our heads," she said. Scarborough remains hopeful. "It's not going to send me into hiding. We're going to have to stand together," said Scarborough, who helped organize a Rainbow Circle discussion group. The next meeting will be at 10 a.m. Saturday on the North Central College campus in the Kiekhofer Hall gathering, 329 E. School St. in Naperville. She's also concerned what will happen to the people who've been insured through the Affordable Care Act that Trump threatened to repeal as soon as he gets into office. "We're going to have to care for the people who get kicked out of the health care system," she said. To do that, Scarborough is urging Americans to move past the divisive election and work together. Social media has allowed people to gather in narrow groups with like-minded individuals. "We don't know how to communicate and reach out to others anymore," she said. “On a personal note, in a few hours, I am getting in my car and driving to North Carolina for the Marine Corps Ball with my partner, who is serving. Everything about that would not be possible without the progress we’ve made the past eight years. I don’t want to see that go away," Fuscarino said. He said the Asbury Park-based organization that defends the lesbian, gay, bisexual, transgender and queer community will continue to fight for rights under the new administration.